Wakefield, N.B. – May 25, 2016 – UFCW Canada members at Covered Bridge Potato Chips have won a first contract, ending their five-month strike and a national campaign calling for a boycott of the company's products. On Tuesday, UFCW Canada Local 1288P members ratified their first collective agreement, in the wake of a two-year struggle for a fair first contract at the Wakefield, New Brunswick snack food processor. The three-year agreement achieved all of the major goals of the members including seniority provisions, job protection language, and wage and benefit gains. "This is a tremendous victory for the members, who were absolutely courageous and determined in their campaign for fairness," says Dan Smith, president of UFCW Canada Local 1288P. "Through thick and thin and through one of the most frigid winters ever, they never lost faith and were ready to hold the line for as long as it took to get a fair first contract." 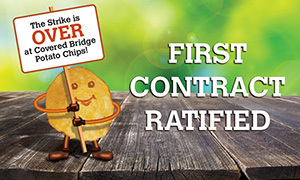 The contract comes just days after UFCW Canada activists and Canadian Labour Congress (CLC) affiliates carried out a National Day of Action, leafleting consumers outside of major food retailers across the country with a call to boycott Covered Bridge Potato Chips. That action was in addition to a comprehensive UFCW Canada social media, web, and advertising campaign which ran throughout the strike that alerted consumers, labour allies, and activists about the campaign for fairness at Covered Bridge. Local 1288P members will start returning to the plant next week with a new contract that covers production workers at the facility. "Congratulations to the courageous members at Covered Bridge Potato Chips," says Paul Meinema, the national president of UFCW Canada. "We wish them and the company the greatest success in the future as a good workplace and a good neighbour in the community."